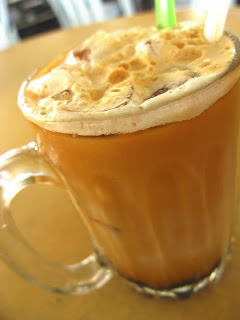 So far this is the best places I tried really "kao kao" milo, teh, kopi...etc. I usually order "3 colour tea" a.k.a 三色奶茶 (sam sik lai char), the best I had in so many other places. 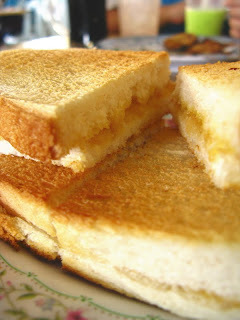 Accompanied by my all time favorite Roti Bakar... Ahhh~ Mum will order her favorite drink Kopi-O Ice Tarik! 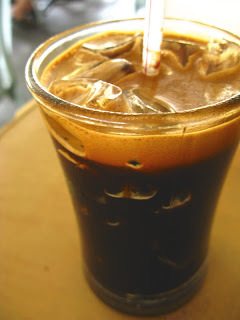 I know her kopi sounded weird, but trust me... it taste great! *Look at the foam on top? It's not milk, It's Kopi-O! Btw, the kopitiam opens until around 4-5pm only, the other food store will be all closed by then as well. I wanna go yum cha. But I dunno how to get there. When you free. LoLz I should be able to go out next week and the week after.